Manufactured by GAMDIAS. Released summer 2014. Review sample provided by the manufacturer. Founded in 2012, gaming peripherals manufacturer GAMDIAS is still making a name for itself. With a focus on artistic designs and making products worthy of pro eSports athletes, they've released a number of mice, keyboards, headsets, mouse mats and accessories. While I can't comment on whether it's good enough for a pro, the Eros V2 7.1 surround sound headset with 50mm gaming-class drivers is certainly good enough for the everyman. First things first: the Eros V2 looks slick. Black with red trim, the headset's suspension cables and plastic earcup covers make it seem right at home in an industrial music band. The design gives it the appearance of something sturdier and heavier than you'd expect - the Eros V2 felt flimsy and breakable in my hands, but when seated on my head, I realized that was the tradeoff for comfort. Accustomed to wearing a heavy headset for hours a day, the Eros V2 is so lightweight that I could have easily forgotten I was wearing a headset at all. That is, if not for the cable. As a cat owner, braided cables are a must for me - I've lost several headsets to the jaws of cuteness before I started getting braided cables. The Eros V2's cable is indeed braided, and a handy in-line remote allows you to adjust or mute the headset's volume, as well as mute the boom microphone. Unfortunately, there is no indicator to let you know whether your mic is muted beyond your guildmates seemingly ignoring you. The mic quality is decent - clear enough for gaming and Skype calls, but nothing you'd want to use for any form of professional recording. I suppose that's to be expected from a headset mic, but I've heard better mic sound quality from comparably-priced headsets. The mic arm is flexible, allowing you to bend it out of the way when you want to take a sip of coffee. Onto the sound quality: it's good. The bass doesn't punch quite as hard as I'd like, but the mids and highs are right where you want them. Plus, the downloadable drivers provide an equalizer with twelve built-in options and full customizability, allowing you to tinker with the exact frequencies you'd like to boost to achieve whatever sound you desire. The software has plenty of other features and options - more than I've seen with any other USB headset. Unfortunately, many of these are presented without accompanying descriptions. Don't know what S/PDIF Output is? DSP Effect? Xear Surround Mix? Well, have fun experimenting. Bottom line: For a gamer, there's little more you can ask for in a headset: it's comfortable to wear, has a decent mic, good sound, and surround sound. Audiophiles will want something with better bass. Recommendation: If you can grab an Eros V2 while it's still discounted on Newegg for $45, you're getting a great deal. 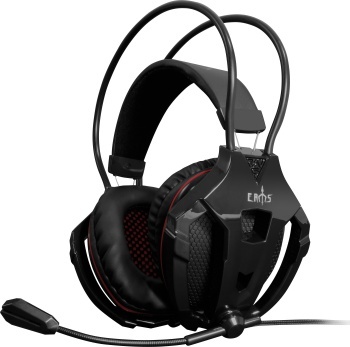 At its normal price of $75, it is priced competitively with other headsets of similar quality.